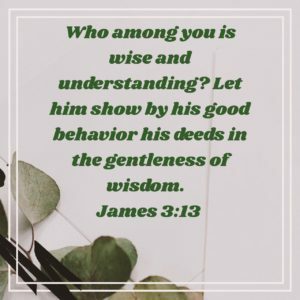 How do you show wisdom? James goes from telling us the difficulty of controlling the tongue to explaining wisdom. What does wisdom look like and how does it act? Read James 3:13. So, wisdom/understanding = good behavior + gentleness. We often don’t think about the importance of gentleness in all that we do. If we are going to display wisdom that is Godly, then we must realize that our actions must reflect that gentleness. We’ve already discussed that faith without works is dead. So is wisdom without works. They wisdom that we gain from God, must result in action. That action is seen in the good behavior and gentleness. Are we acting out the wisdom that God has given us in such a way that others would see it as wise?